While practitioners and taxpayers alike frequently focus on the substantive rules regarding the deductibility of an expense, an otherwise deductible amount may be disallowed if it is not properly substantiated. Adequate substantiation is by its nature dependent upon the facts and circumstances of each case. In this course we will review the basic rules of substantiation and look at the facts presented in several recent cases to gain insight into the level of substantiation necessary to support various types of business expenses. Identify the types of records necessary to support a business deduction. Recognize the various methods of substantiation available. Indicate when corroborating evidence is necessary to substantiate a deduction. 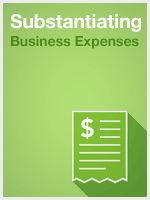 Define the substantiation requirements for various specific types of expenses.